Magnus Berglund, Director of Accessibility at Scandic Hotels, has been invited by the European Union to present Scandic’s award-wining accessibility training at The EU’s Tourism Education & Training Offer conference to be held in Brussels on October 21. Scandic Hotels, the largest hotel operator in the Nordic region, has been shortlisted for a European Diversity Award in the category “Diversity Team of the Year.” The award ceremony will be held in London on September 30, 2015. Magnus Berglund, Director of Accessibility Scandic, with service dog Dixi. Scandic’s successful work within accessibility has yet again attracted global attention as one of the finalists in the World Responsible Tourism Awards 2015. The award ceremony will take place at World Travel Market in London on November 4, 2015. 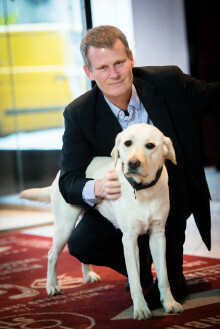 Magnus Berglund, Director of Accessibility, has been invited to be keynote speaker at the first international congress on tourism focused on travel for people with different types of disabilities – The World Summit Destinations for All – which is being held in Montreal, Canada from October 19 to 22, 2014. Ensuring the same high level of service for all guests, whether or not they have a disability, is an important goal for Scandic, but what exactly is the best way of serving a blind guest, for example, and what is the most important thing to do when a guest with a hearing impairment comes into reception? 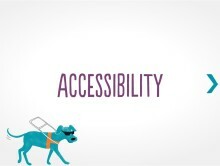 Scandic is launching wide-ranging interactive training on disabilities, open to everyone. Assistance dog Ada retired by the 31 May 2013 after 11 years of faithful service. 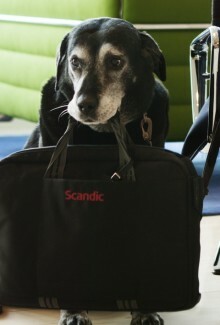 She has been assisting Scandic’s Director of Accessibility, Magnus Berglund, since 2002.